The Hundred-Year-Old Man is a movie directed by Felix Herngren which bills itself as a comedy, however there is absolutely nothing funny about the shocking abuse of poor Vana Mana, the elephant whose use in the movie has been condemned by ADI and PETA ahead of its release in Germany on March 20th 2014. Vana Mana (also known as Wana Mana) featured in a shocking undercover exposé by ADI at the Great British Circus in the UK. The owner of this infamous circus - which is no longer on the road - has since sent tigers to his son in Germany who performs with Circus Krone. Whilst at the Great British Circus, Vana Mana, as well as her companions Sonja and Delhi, were beaten by both her trainer Lars Hölscher and groom and chained for long periods. Delhi was chronically lame at the time and has sadly since died. 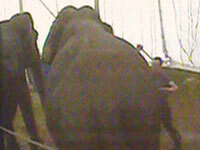 Our horrifying footage prompted an outcry and the elephants and their trainer left the UK after just one season. They have since been touring with circuses across Europe, with the trainer changing both his name and that of the elephants. In Sweden last year, Vana Mana and Sonja – now known as Ghandi and Baby – were forced to perform at Cirkus Skott. After their identity was discovered Cirkus Scott announced that it would stop using wild animals. Elephants are intelligent and emotionally complex wild animals and their use in film and other forms of entertainment is widely condemned. Please help us stop the suffering by avoiding The Hundred-Year-Old Man and other films that feature performing animals.